In The Killables, Gemma Malley explores the age old conflict: good versus evil. This beginning of a new, suspenseful dystopian series will force readers to re-evaluate their own ideas of what it means to be truly good or truly evil. Malley's world-building is thought-provoking, detailed, and full of danger and deceit. Every page is filled with ideas and philosophies that shape the society in which the protagonist, Evie, finds herself lost and struggling to belong. Evie lives inside the City fighting temptation and any emotion that will prove she's let evil take hold of her mind. She's plagued by dreams that she doesn't understand and she fears will cause her to loose her B-label. The City, led by the Brother in the stead of the Great Leader, classifies its citizens by labels: A, B, C, D, and K. The System knows when people have allowed evil to tempt them and changes their labels accordingly. Until Evie realizes that the System is more sinister than she's been led to believe, she's content to marry Lucas, the straight-laced A, and work as a label-changer in the government buildings. Malley is an exceptional story-teller who knows how to keep the story flowing and exciting. Readers will build in anticipation as the story unfolds in various third person perspectives, though the majority of the story is from Evie's point-of-view. 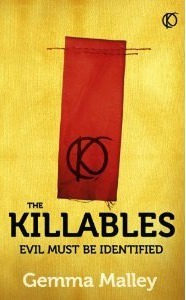 The Killables will give readers an insatiable appetite for Malley's characters who are fraught with flaws and realistic mentalities. This dystopian novel has a touch of science fiction and survival elements that longtime fans of Malley will surely appreciate!